Put the bacon into a large heavy pot and place it over medium heat. Cook for about 4 minutes. 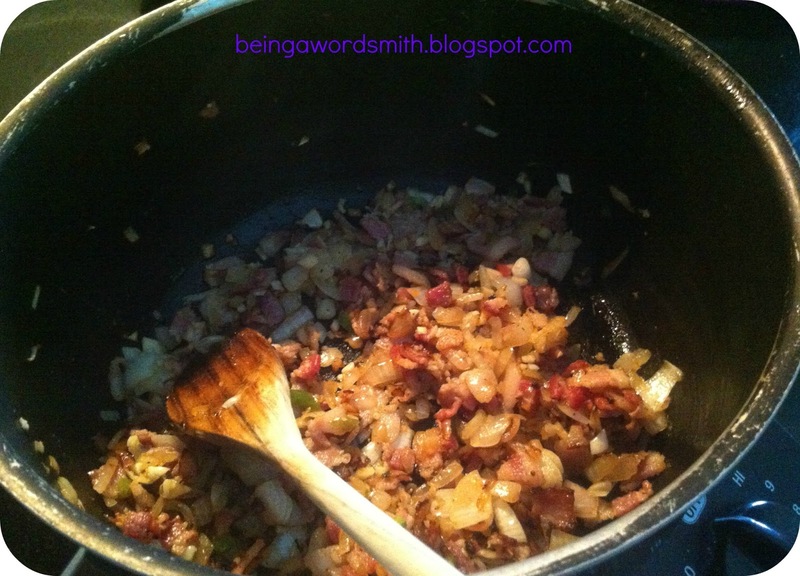 Stir in the onions and cook until they start to turn translucent, about 4 minutes. Stir in the garlic and habanero pepper and cook for about 1 minute. Add the broth, tomatoes, ketchup, Worcestershire sauce, and chili powder. Stir in the beans, turn the heat to high and bring to a boil. 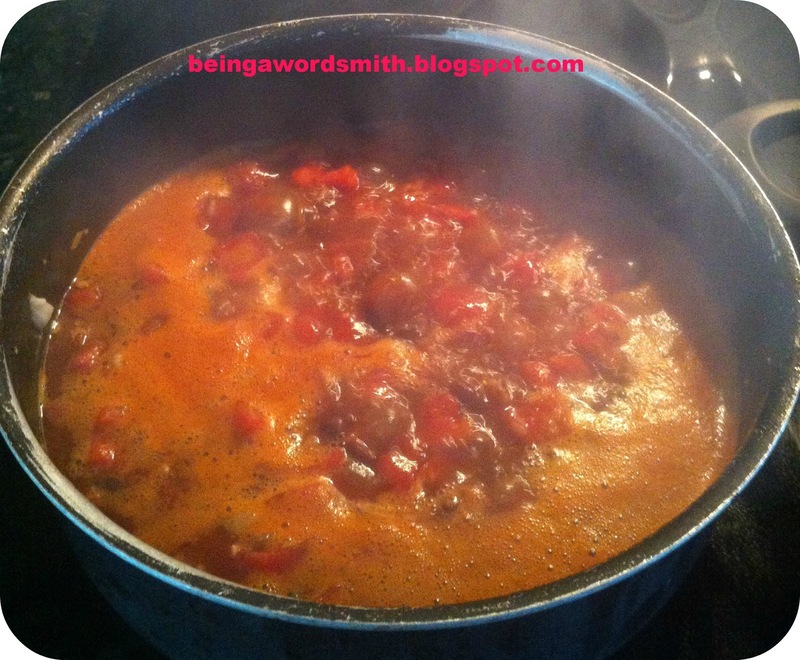 Adjust the heat so the soup is bubbling gently and cook 10 minutes. Season with salt and pepper. Pull cilantro leaves from stems and chop coarsely while soup simmers for 10 minutes. 5 minutes before you are ready to serve, stir in the cilantro. Then stir in half of the lime juice. Serve soup with garnishes on top. Finish each serving with rest of lime juice. Yields 8-10 servings. Have you ever tried black bean soup before? What are your thoughts on white bean soup? Things You Learned in School But Never Used Again in Life–Ever! Congratulations! Your post was my feature pick at #ThursdayFavoriteThings this week. Visit me on thursday morning to see your feature! All hosts choose their own features from the comments left on their blog so be sure to return to my blog to see your feature. I invite you to leave more links to be shared and commented upon. Please don’t forget to add your link numbers or post title so we can be sure to visit! Woohoo! Thanks, Marilyn. I appreciate that. 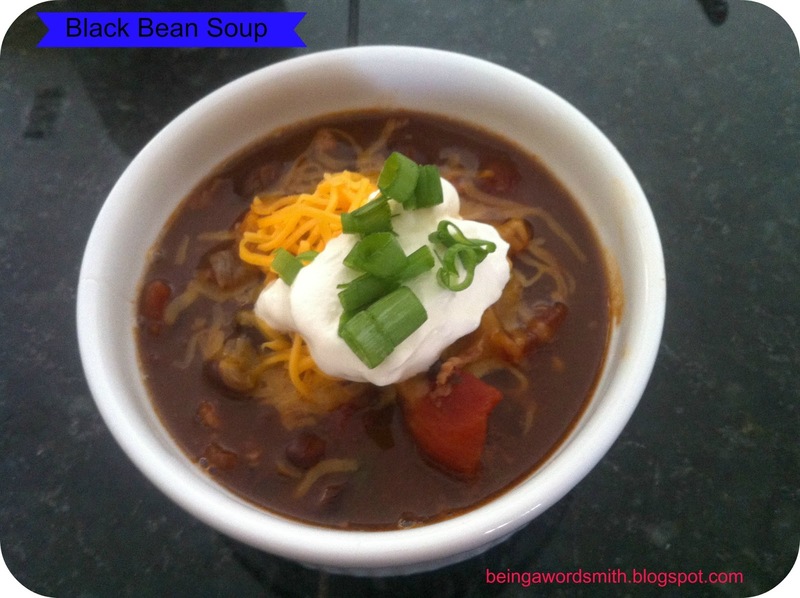 I adore black bean soup … and your version sounds great! Nice to meet you through #SITSBlogging! Black bean is my fave and that dollop of sour cream at the end makes it look so purty. 😉 🙂 Thanks for the recipe share. My recent post Teespring (an EXCELLENT service for fundraising and the like)! And the sour cream tastes great with the soup. Thanks for commenting, Rosey! I need to clip this to my Pinterest recipe board. On to it right now. Thanks, Kimberly! I appreciate that, Alison. Thanks. Looks yummy! This would be delicious with cornbread drizzled with honey! Now I'm thinking about cornbread drizzled with honey. My mother has a great recipe for cast iron skillet cornbread. Thanks for stopping by! Looks yummy! I love black bean soup! I usually put lime, lemon and oj in mine! Lemon and orange juice? Wow. I'll have to try that. Thanks, Michelle! Yes, turkey bacon comes from a turkey. It is leaner than regular bacon. You can find it in most grocery stores. I've also heard of chicken bacon but I've never tried it. Please do, Kristen. Let me know how it turns out. Following you on Twitter! My recent post Dinner Menu – FREE PRINTABLE! Looks yummy! Turkey bacon? I have never heard of it. Is it bacon from a turkey and where do you get it from? I love black beans and this is definitely worth trying. Thanks Reginia. I appreciate you stopping by. Checking out your blog now. The garnishes bring the whole thing together. We've been eating it for two days. Delicious! Black bean soup is my favorite in the whole world! Thanks for sharing!! THis looks so delicious Kim! It was my first time making it. I couldn't believe how easy it was and how good it tasted.